You guys remember my DC date night series, right? I blogged about the National Harbor - one of my favorite local destinations for date night! Today I'm going to share another favorite part of town: the Mosaic District in Fairfax! The Mosaic District has it all from restaurants to shops to a world-class movie theater that serves wine and gourmet food. I love Angelika Film Center & Cafe because the seats are comfy and you get to pick them in advance, which takes the stress out of having to show up early. It's also such a lovely area; outside the Angelika theater they often play movies on a big screen overlooking a nice patch of grass, where you can also go for yoga classes on the weekend! There's some great food options, too: Sweet Green and a MOM's Organic Market. And -- the inspiration for this post, True Food Kitchen where you can dine even when you're on the Whole30! My friend Naomi recommended this restaurant to me and I'm so glad that she did! They're unlike any other restaurant I've ever been to because they don't serve soda and everything on the menu is fresh, locally sourced, and supports an anti-inflammatory diet. Not only that, but being on the Whole30 you cook a lot! It's hard to find places where you eat out without the stress of knowing whether your options are Whole30 compliant. That's why it was such a treat to go toTrue Food Kitchen during the program! I even got to have dessert: the banana chia pudding, which was out of this world good! A few other cool options on the menu at True Food Kitchen: "Kale-aid" made of kale, apple, cucumber, celery, and lemon and ginger! Spaghetti squash casserole (I don't think I've ever seen spaghetti squash on a menu anywhere, ever!) and big delicious sounding salads made up of cucumber, olive, tomatoes, quinoa, feta, and lemon oregano vinaigrette! I seriously can't wait to go back! 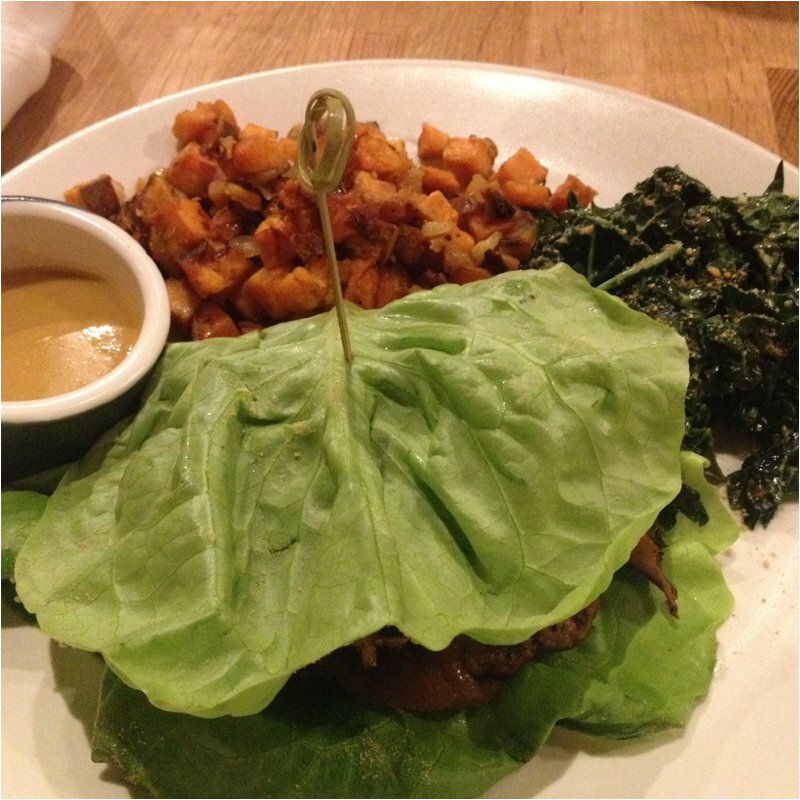 When we went I ordered the bison burger "protein style," meaning it was served with lettuce, not a bun! It came with a side of sweet potato hash and a delicious kale salad. Everything was so good - I cleared my plate! Have you ever been to Mosaic District? Where you do have date night? Have you ever been to a healthy restaurant like that?